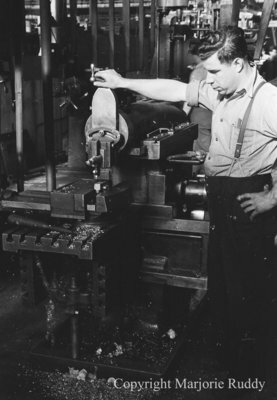 Black and white negative showing a machine shop worker using a drill press. In this view he has one hand on the top of the press. The other hand is on his hip. The machine shop could possibly be the Whitby Malleable Iron and Brass Company. Machine Shop, c.1940, Marjorie Ruddy. Whitby Archives A2013_040_818C.